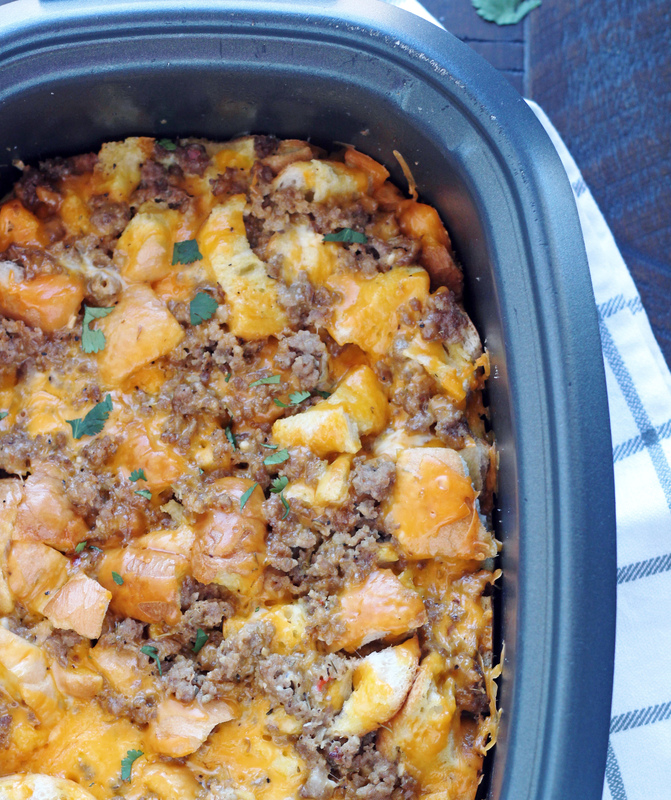 Perfect for breakfast, brunch or dinner, this Slow Cooker Classic Breakfast Strata is so incredibly delicious. True comfort food at it’s best! This will definitely become a favorite. I’m sure there are a lot of you out there who love breakfast for dinner like we do. I usually do breakfast for dinner two or three times a month, but my boys would think I completely rock if I fixed it two or three times a week. 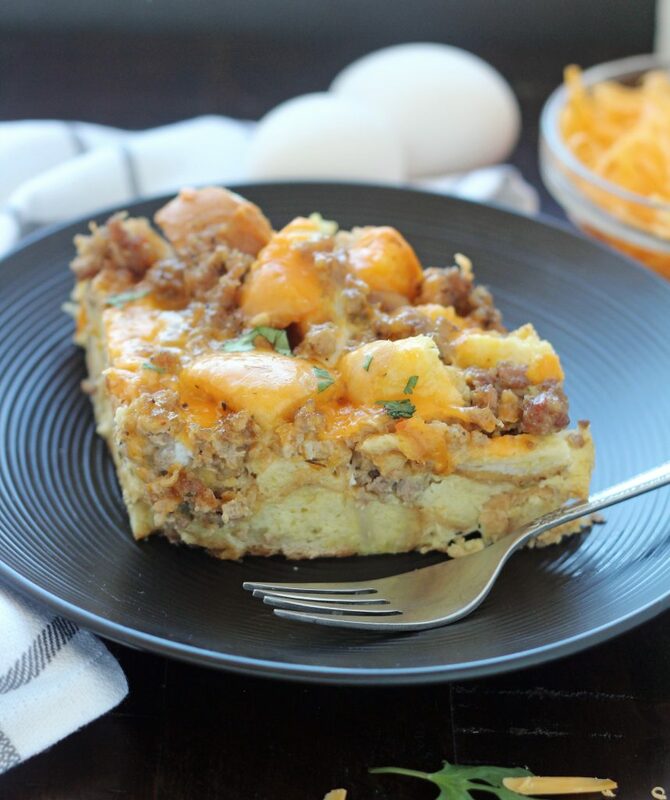 This Slow Cooker Classic Breakfast Strata has quickly become a favorite of theirs the last few months. Every time I make it they devour it. I’ve served this with fruit and kept the whole meal “breakfasty” but I’ve also served it with a green salad. . . it’s delicious with anything, or just on it’s own. Now I should warn you that there are a few steps involved here. This isn’t one of the “dump and walk away” slow cooker recipes. So sorry, but I promise it’s worth the couple extra steps. The toasting of the bread is an absolute must! It’s key for producing a strata with good texture and one that doesn’t turn mushy as it bakes and absorbs the egg mixture. Pleeeease don’t skip this step. While the bread pieces are baking, I will cook the sausage, grate the cheese and get the egg mixture ready. It’s all about multitasking my friends! When the bread is done, everything is all ready to assemble in my slow cooker. Now, you can layer everything, turn it on and walk away. Four hours later you will have this beautiful, delicious strata just waiting to be devoured. We sometimes will throw some sour cream and salsa on top, but most the time we just eat it as is. Preheat oven to 250 degrees. Spread bread pieces onto a large cookie sheet and bake, shaking pan occasionally, until dry and crisp, about 30 minutes. Brown sausage into a large skilled, using a wooden spoon to break up large pieces. Just before sausage is no longer pink, add onion powder, minced garlic and red pepper flakes (if using). Continue cooking until sausage is cooked through. Remove from heat and drain any grease. Spread half of the dried bread into the prepared slow cooker and sprinkle with half of the sausage and 1/2 cup of the cheese. Layer remaining dried bread, sausage and cheese. Whisk together the eggs, half-and-half, salt and pepper until well combined, then pour evenly over bread. Press gently on the bread to submerge. Cover and cook until center of strata is set, about 4 hours on low. Let strata cook for 10 minutes then serve. You may or may not use the entire loaf of bread, just depends on the size. Just measure out 12 cups. Usually if I only have a slice or two left, I just go ahead and cut it into pieces and use it. I usually use a full pound of sausage when I make this because we like sausage. I don't feel like using a full pound is by any means too much sausage, so if you want a little more sausage in your strata, I would use 3/4 - 1 pound, rather than just the 8 oz. Also, the original recipe calls for chopped onion, so feel free to use 1 small chopped onion in place of the onion powder if you'd like. Sometimes a couple of my boys will pick out onions, so I save them the hassle and leave them out and use onion powder instead. I do like to put a layer of paper towels over the top of my slow cooker and then put the lid on, this keep any extra moisture from dripping onto the strata. I also have cooked this on high for 2 hours before when I've needed it to be done fast and it works perfectly. 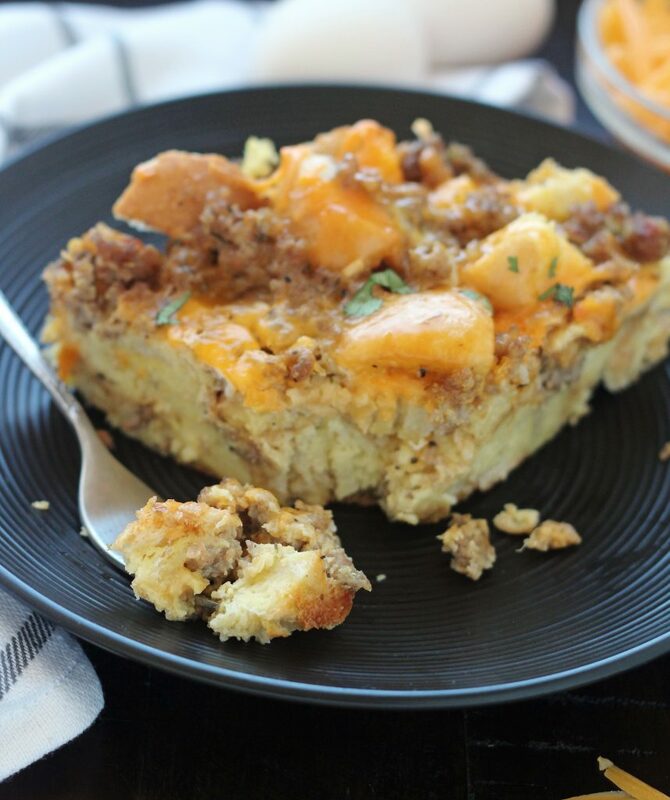 Can this breakfast strata be cooked in a casserole crockpot? Hi Joanne, not sure what you mean by a “casserole crockpot” If you mean a crockpot/slow cooker, then yes of course.